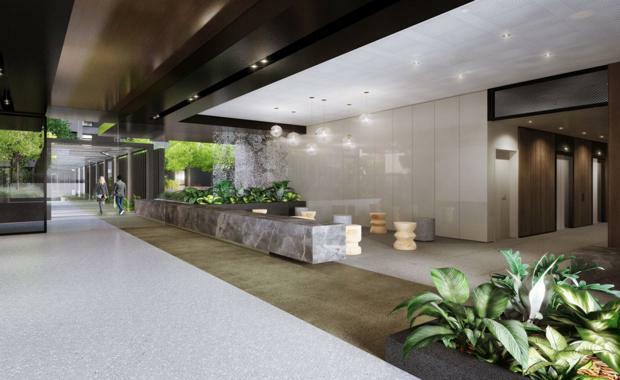 New multi-residential project Liverpool Central designed by ROTHELOWMAN capitalises on NSW’s development strategy to create more employment clusters. The $120m apartment project (sale value) will cater to rapid population growth, comprising of two medium-rise towers for a combined 240 apartments. Population forecasts prepared by Urbis based on the NSW Bureau of Transport Statistics data project the population of the Liverpool Study Area will grow by 13,900 new residents between 2011 and 2036, equating to growth in new residents of 1.5% per annum. The project is strategically located to benefit from Liverpool being earmarked as a major new employment hub, along with the proposal of new roads and a second airport in the immediate area. Research by Urbis indicates the area will be transformed into a vibrant education and infrastructure hub by 2036. Already, infrastructure investment in the area totals over $7 billion in projects set for completion in the next 10 years. Given the lower price point of Liverpool dwellings compared to inner-ring Sydney, the high number of greenfield sites available and the growing employment opportunities, ROTHELOWMAN anticipates great interest in the project. “I think most people in the industry don’t know that there are two million houses about to be built in the next two decades,” Pomroy says. ASX-listed agents McGrath Projects have been confirmed as the sales agent of the project that hits the market in early 2016. With a portfolio that is in excess of $1 billion, the firm is selective on the projects they manage and clients they take on, with Liverpool Central their first major project within the suburb. Liverpool Central[/caption]“What appealed to us was the scale and design of the building,” says McGrath Projects Partner Steven Chen. Located in Bigge Street, Liverpool Central will contribute to the area in a positive manner with stunning design and architecture. “Our feasibility and due diligence of the project coupled with our extensive knowledge of the area and surrounds believe it will have a solid uptake from savvy investors, local occupiers and Asian investors,” Chen says. Materials in the design have been carefully selected, with floor plans maximised to create clean, fresh spaces. Residents of Liverpool Central will be also able to enjoy extensive communal amenity within an inner courtyard, including lawns, barbecue areas and table tennis facilities all on site. Despite being a period of growth, Liverpool already offers residents exceptional amenity. Residents of Liverpool Central will benefit from the nearby train station, Liverpool Transport Interchange, with Westfield Liverpool Shopping Centre just minutes from their doorstep.